You know, on the way back from Mumbai to go meet with President Xi in China, I stopped in Singapore to meet with a guy named Lee Kuan Yew, who most foreign policy experts around the world say is the wisest man in the Orient. The word “Orient” is considered widely outdated and could be perceived as offensive, or insensitive, especially when used in reference to people. So did the rival party, the Republicans. “His comment is not only disrespectful but also uses unacceptable imperialist undertones. It’s time for the vice president to apologize and to understand that his comments embarrass our country,” Fetalvo added. 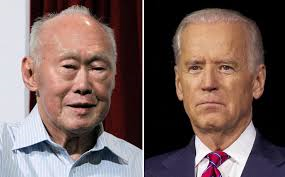 If anyone should be offended by Biden's brash remark about LKY, shouldn't it be Singaporeans? I found out about this only after watching last Thursday's episode of The Daily Show where John Stewart made fun of Biden's gaffes. I mentioned it to my TNP colleagues and it was finally reported by Singapore media yesterday. It seems Singaporeans are less sensitive about the word "Orient" than Americans are. As one local netizen commented: "I didn't know the word 'Orient' is offensive to Asians." Indeed, not very long ago, in the 1987 broadcast of the Miss Universe pageant from Singapore, our country was referred to as "the exotic Orient". I guess to Singaporeans, "Orient" just seems comically retro rather than offensive, like someone saying "groovy" or "disco". Murder On The Orient Express, anyone? It's not like Biden called LKY "one smart Oriental". Now that would be racist. Just like the hotel. I suspect Singaporeans are more likely to be disturbed that the Veep referred to our 91-year-old former prime minister as "a guy named Lee Kuan Yew". Since when did Biden become a character from Hitchhiker's Guide To The Galaxy? LKY's just this "guy", y'know? This linguistic dissonance reminds of the culture shock I experienced when I went to the US for college in the late 80s. It was a transitional period when the language of "political correctness" was just starting to take hold. I was surprised to learn that words like "Chinaman" and "Jap" are considered racial slurs. "Oriental" was replaced by "Asian". But being called "Asian" felt strange to me. I thought of myself as Singaporean or Chinese, but rarely Asian even though I am one. Granted, I would feel even weirder being called "Oriental". The non-Caucasian American students in my college liked to call themselves "people of colour", which I found bizarre. Since I was also non-Caucasian, by default, I became a "person of colour" too. I also had to get used to being called a "minority". So when the issue of "Chinese privilege" in Singapore was brought up recently, I thought it was about time - although it should be more accurately called "majority privilege" since it can apply to any multi-racial society. I assume this came out of the debate over "white privilege" in the wake of the Ferguson protests in the US last month. So while the US and Singapore have different racial histories and are offended by different words, I believe the problem of "majority privilege" is at least one thing we have in common. By the way, "shylock" is also a no-no. Blame Willy Shakespeare.